Uzbekistan Stick Flag - 4x6"
Uzbekistan flags are strong symbols of the Uzbek people and their nation. The flag was selected from a variety of designs that were submitted by the Uzbek people after the nation gained its independence near the end of the 20th century. The government acted quickly, which gave Uzbekistan the honor of being the first of the newly-independent nation in Asia to select a flag following the fall of the Soviet Union. 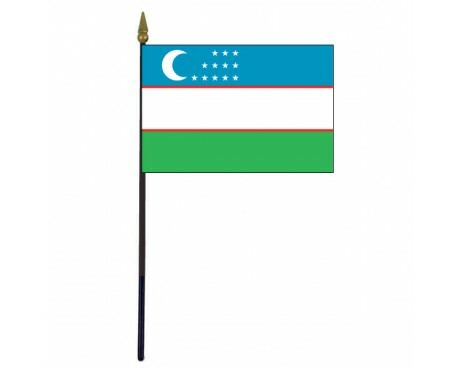 The flag of Uzbekistan (Uzbek: Oʻzbekiston davlat bayrogʻi) was approved at the Seventh Extraordinary Session of the Supreme Council of the Republic of Uzbekistan, on November 18, 1991. 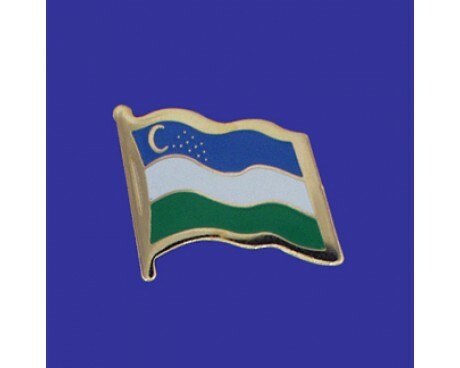 Symbolism according to the Uzbek embassy: The State flag of the Republic of Uzbekistan was approved at the Seventh Extraordinary Session of the Supreme Council of the Republic of Uzbekistan, on November, 18, 1991. 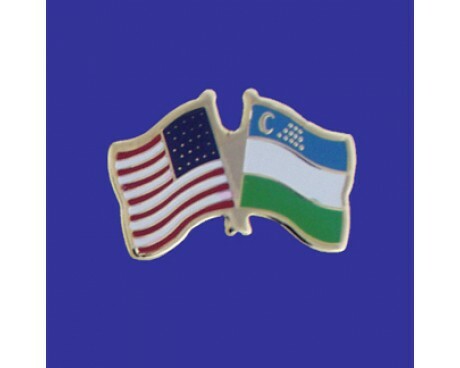 The State flag and its symbols portray the historical links with states which have existed in the past within the borders of modern Uzbekistan and embodies in itself the national and cultural traditions of the republic. Uzbekistan flags five horizontal stripes. The blue, white, and green stripes are significantly thicker than the two red stripes, which serves as a border around the white band. The flag's canton displays a white crescent moon and twelve white stars. The crescent moon is a symbol of Islam, which is the most commonly religion in Uzbekistan by a very large margin. The stars represent the months of the Islamic calendar and the constellations of the Zodiac. Each color also has a symbolic meaning of its own. The blue band is a reference to the flag of Timur, who once ruled over a significant part of Asia. It is also a symbol of the sky and water. The white band is a symbol of peace and spiritual purity for the Uzbek people. The green stripe is a symbol of nature, although it is also often used on flags as a symbol of the Islamic faith. The red bands represent life as embodied by the blood that flows through living creatures. 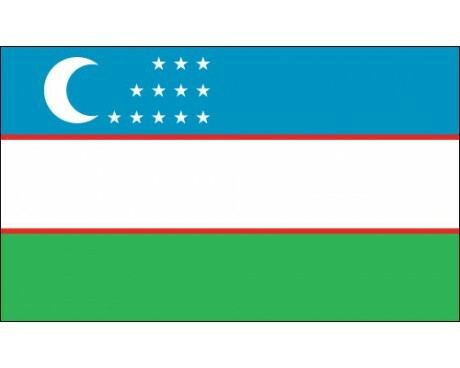 The modern flag of Uzbekistan drew inspiration from the flag that represented it during the Soviet era. That flag came into use to represent the Uzbek Soviet Socialist Republic in 1952, and it strongly resembled the flags of many other nations within the Soviet sphere of influence. It had a solid red field that was divided into two parts by a light blue stripe with a white border. It also had the crossed hammer and sickle below a star in the canton. The red field, hammer, sickle, and star were symbols of the Soviet Union, while the blue stripe represented the sky and the white border represented the nation's cotton industry. That flag fell out of use when the Soviet Union fell, and Uzbekistan replaced it with the current design in 1991. The influence of the Soviet flag can still be seen in the modern flag's blue stripe, which was taken from the flag of the Soviet era.